This is the second in a collection of stories taking place in the world of my fantasy novels! Terin and the gang from Arch Enemies and The Axes of Evil make an appearance in one murder mystery story. “The Mystery of the Black-Bearded Dwarf” by Michael A. Ventrella: Terin and his fellow squires find themselves in dwarven lands, having to solve a murder where everyone has a motive and an alibi. Can they figure out whodunnit and prevent the dwarven clans from going to war? “Embarrassing Relations” by Bernie Mojzes and Bob Norwicke: After defending Ashbury from an unspeakable horror from beyond time and space, Maris Goselin finds herself with a new assignment: help the Duke avoid spending quality time with a gibbering out-of-town relative. It seems easy, but Maris soon realizes that although the relative may be insane, insanity is relative, and sometimes making a living has life-threatening consequences. “Knight’s Gambit” by Tera Fulbright: A newly ordained knight learns that some things really are black and white. “Curso and the Perilous Purple Pixie Problem” by Roy C. Booth and Brian Woods: Curso and his friends find themselves traveling to a mysterious cave in order to save a pixie who may be more trouble than she’s worth. “A Hero of Padrin’s Hold” by Mike Strauss: Sometimes a hero does things that are necessary, and sometimes it is best when no one knows. “The Golden Gifts” by Laurel Anne Hill: Artha, a biata gifted in magic, must outwit a powerful necromancer. Only a few hours to complete this task remain. If Artha succeeds, her brother’s dying daughter will rest in peace forever. Failure, however, will doom Artha and her beloved young niece to the ranks of the undead. “The Vacarran Corsair” by Jesse Grabowski: The streets of Dockside were never the safest of places, even in broad daylight, and even for a skilled pirate. This is a place for homeless children, wealthy and ruthless thieves, and corruption. Here, even the heart of a pirate can change. Loss of innocence can sometimes remove thoughts of plunder and loot … sometimes. “The Chandler’s Tale” by Henry Hart: Pursued by monsters, a boy becomes lost in the elven wood where he learns that some things are worth dying for. “Beyond the Bitter River” by Jon Cory: After being banished from the kingdom, Sarlon races for the border, pursued by the king’s guards. 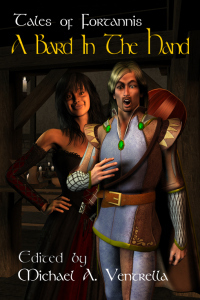 His only hope lies in a mysterious elven girl who has taught herself how to do magic … poorly. “Dreamed Tortures” by Mark Mensch: Nigel finds himself in the home of his long lost love, Kayleigh –however not everything is as it seems. All actions have consequences and the people he relieved of their valuable artifact have some type of payment in mind.